As I make a return to the keyboard, a million things have rushed through my mind on what to share, what to say, what to complain about, what to yell at you for not doing with your dog…etc etc….While in the midst of ADD paralysis last night brainstorming I suddenly knew exactly what I wanted to share with you. Reading is something that for some of us is a luxury. It takes time, plain and simple. Somewhere along the line I managed to take the time to pick up a book and give it a read. The book was easy to pick up as I had been seeing it all over my Facebook feed. 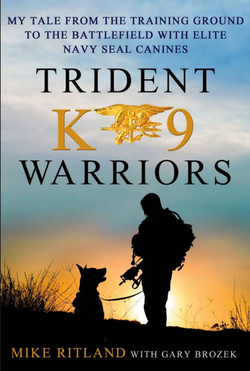 Author Mike Ritland, a former member of our nation’s elite Navy SEALs, has taken his life experiences with a very unique population of dogs and shared it with us in his book Trident K9 Warriors. The majority of the population has no idea what goes on with this truly unique group of soldiers, let alone the dogs they work side by side with. Honestly in my time working in the world of protection dogs I feel rather comfortable saying even the majority of self proclaimed “experts” and “master dog trainers” have never even laid eyes on the caliber of dogs employed by the SEALs. Ritland introduces the readers to these animals in a very easy to read book that will have you turning page after page effortlessly. Starting out with some background information, you get to meet Ritland and find out who he is and what got him started on a path that would take him around the globe and put him in contact with the best dogs the world has to offer. I could go on and on giving you details and blabbing about how amazing of a read it was but then you would lose precious moments of your time reading my rambling leaving you with less time to read this book. I’ll sum up my thoughts on how great of a book this is by sharing this one super brief story. My mother called me one night to tell me about this book she read that was one of the best reads she had the pleasure of enjoying in awhile. Even with that introduction I was simply humoring her as I was sure I would have little to no interest in any type of book my mother would recommend, but she is my mother, so I pretended to be immensely interested. My mother is not a dog person by any stretch of the imagination so my jaw hit the floor when she said the title. I remember asking her, “You actually read THAT book?” She scoffed at my disbelief and went on and on how much she enjoyed it and then asking me questions about the training and dogs involved in the content. We actually talked about dogs for more than 30 seconds, a new record for her and I. If you are a dog person, read the book. If you aren’t a dog person, read the book. You won’t regret it. And if you do, feel free to comment below so myself and the others can alienate and criticize you for your poor taste in reading material. To learn more about the author of Trident K9 Warriors click HERE.